Despite calls for diversity and greater opportunity, the number of women working in film is pitiful. According to a report from the Center for the Study of Women in Television and Film, women comprised just 7% of all directors working on the 250 highest-grossing US domestic releases in 2016. These statistics (and others like them) are, of course, familiar all over the world. While it is important to engage in conversation, action is now desperately needed. One of the ways that we, as cinema going audience members, can help is by seeking out and championing those films directed by women. Money still talks the loudest after all. This year, as you can see below, there have been a number of hugely impressive films across a variety of genres released in 2017 (UK release dates) from female directors. Click Here For More Film Reviews, News And Features! Synopsis: A look at the lives of a group of teenage girls growing up in New York. Synopsis: A Chinese woman trains to become a mortician. Synopsis: Climate change campaigner, Al Gore, explores the ongoing environmental crisis. Synopsis: A couple attempt to save their marriage by turning their arguments into songs. Synopsis: In 1973, tennis champion, Billie Jean King, accepts a challenge from former men’s champion, Bobby Riggs, to a winner takes all match. Synopsis: A young man struggles to come to terms with his sexuality in New York. Synopsis: Sam is stuck reliving the same day over and over until she can solve the mystery of her death. Synopsis: A tourist begins a relationship with a schoolteacher who soon reveals an unsettling and dangerous obsession. Synopsis: A documentary about the British band, the Sleaford Mods. Synopsis: The story of the making of a film about a famous writer who, as a student activist, witnessed a massacre in 1976. Synopsis: Filmmaker, Kirsten Johnson, shares key and insightful moments from her career as a cinematographer. Synopsis: An exploration of the continued fascination with one of America’s most infamous child murders. Synopsis: Exploring the formative years of director, writer and artist, David Lynch. Synopsis: Survivors of Nazi death camps talk about their experiences and feelings. Synopsis: A group of people find themselves in a nightmarish and horrendous situation during the 1967 Detroit riots. Synopsis: Exploring society's worrying obbession with female body image. Synopsis: The story of Cambodian author and human rights activist, Loung Ung, and her experiences under the regime of the Khmer Rouge. Synopsis: A married woman is sent to the Alps to treat her kidney stones, where she falls in love with another man. Synopsis: A documentary about the life of singer, Grace Jones. Synopsis: A father is faced with challenging decisions when his daughter’s academic future is compromised. Synopsis: The story of the UK’s hidden homeless, told via the experiences of one family. Synopsis: A newly separated woman takes in three young filmmakers as lodgers. Synopsis: A nine-year old Zambian girl is accused of witchcraft and sent to a witch camp. Synopsis: Three Arab-Israeli women, living in a flat in Tel-Aviv, try to find a balance between traditional and modern culture. Synopsis: Following the thousands of feral cats living on the streets of Istanbul and the residents who care for them. Synopsis: Exploring the life of English writer, traveller, political officer, administrator and archaeologist, Gertrude Bell. Synopsis: Four Syrians in Lebanon attempt to rebuild their lives amidst the chaos of war. Synopsis: A Canadian woman goes to Paris to help her elderly aunt. Synopsis: Three people from different backgrounds discuss their feelings about love, family and relationships. Synopsis: The life story of Canadian artist, Maud Lewis. Synopsis: An illegal immigrant in New York City is drawn into a dangerous game after being offered a lucrative job by a friend. Synopsis: A woman struggles to raise her kids on her husband’s Mississippi Delta farm when two brothers return from war to work on the land. Synopsis: A mother and her two daughters have to defend their home from a relative. Synopsis: Love blossoms between two abattoir employees after they discover that they share the same dreams each night. Synopsis: Within the insular world of New York’s Haisdic community, three individuals are driven to break away. Synopsis: A primary school teacher is tested by the arrival of a challenging pupil. Synopsis: The story of psychologist William Moulton Marston, the polyamorous relationship between his wife and his mistress, the creation of his beloved comic book character Wonder Woman, and the controversy the comic generated. Synopsis: Following a family’s journey to establish themselves in Jerusalem. Synopsis: A young girl’s life is changed forever after an initiation ritual at her vetinary college. Synopsis: Following Julian Assange after the Wikileaks release of the Iraq War Logs in 2010 and through his years of refuge in the Ecuadorian Embassy in London. Synopsis: A wild hen party goes fatally wrong. Synopsis: The story of the teachers and pupils at a boarding school in Ireland. Synopsis: Following several members of a high school girls dance team. Synopsis: A young woman struggles to survive after being cast out into a landscape of cannibals and scavengers. Synopsis: In Virginia during the American Civil War, a girl takes a wounded Union Soldier back to her school for girls. Synopsis: A group of students accidentally unleash a terrifying supernatural entity. Synopsis: A young girl joins a competitive dance team just as the girls fall victim to strange fainting fits. Synopsis: A writing team is tasked with making morale-boosting propaganda films during World War 2. Synopsis: A trainee vet returns to her family’s farm after the suspicious death of her brother. Synopsis: A woman uses her magical potions and spells to try to find love. Synopsis: A civilised dinner party descends into chaos. Synopsis: A documentary about former US President Ronald Reagan. Synopsis: Poland, 1939 - a couple join the Resistance and use their zoo to rescue people from the Warsaw Ghetto. Synopsis: After splitting up with her fiance on the eve of her wedding, an Israeli woman is determined to find a replacement husband. Synopsis: During the Egyptian revolution of 2011, surgeon turned comedian Bassem Youssef airs a television show that makes him popular with his countrymen but disliked by the government. Synopsis: A young woman struggles with anorexia. Synopsis: A father tries increasingly bizarre ways to reconnect with his daughter. Synopsis: A portrait of life in the Texan town of Uncertain. Synopsis: A vampire attempts to end the war between two clans. Synopsis: A woman tries to destroy the life of her ex-husband’s new fiancee. Synopsis: A woman documents her battle with chronic fatigue syndrome. Synopsis: Exploring Lord Mountbatten’s time as Viceroy of India. Synopsis: A warrior princess leaves her idyllic home to bring an end to war. Who Are Your Favourite Female Film Directors? 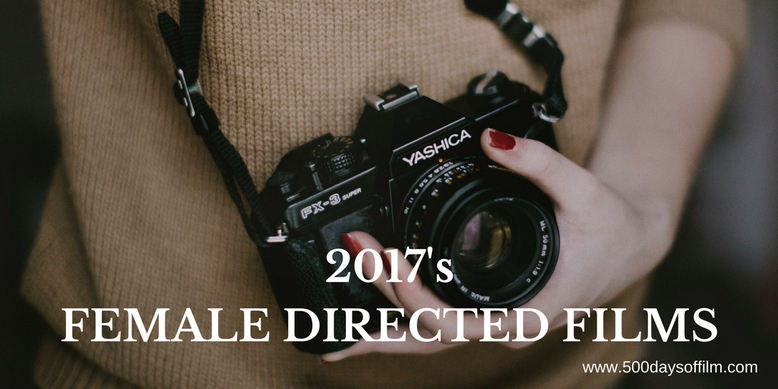 Who are you favourite female directors? Have I missed anyone off my list? Do let me know in the comments section below or over on Facebook or Twitter (@500DaysOfFilm). Sadly, I've seen a couple of these. A handful more were already on my radar and I plan on watching those soon. Thanks for letting me know about the rest.